Discover a wide variety of vacation rentals on The Lake of the Ozarks with Four Seasons Property Management for your upcoming trip. Offering lakefront homes of all sizes as well as pet-friendly accommodations we are sure to have just what you are looking for! Complete with a variety of amenities and features, start browsing and begin planning your Missouri lake vacation today! Contact our office for additional assistance finding the perfect rental for your next Missouri vacation. 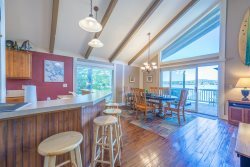 Our large selection of vacation rental properties throughout beautiful Lake of the Ozarks will ensure that you find your perfect Lake of the Ozarks lodging. Whether you are searching for a home on the waters edge with its own private dock or a cabin tucked away in the hills with sprawling views, we have just what you are looking for! Additionally, all rentals come complete with a variety of amenities and features to make your trip that much more enjoyable; with the option for ad ons too! From all linens to the basics for the kitchen, weve got you covered. So, what are you waiting for, browse vacation rentals in Lake Ozark, Osage Beach, Gravois Mills & more! Contact our office for assistance finding a Lake Ozarks lodging option that suits your exact needs. City of Lake Ozark is home to Bagnell Dam and the historic Bagnell Dam Strip. This area includes the North Shore Area, Horseshoe Bend area leading to Four Seasons, all of Bagnell Dam Blvd. leading to Osage Beach and the Osage Beach Parkway. Four Seasons is proud to also offer long-term rental options perfect for an extended stay or temporary housing if you are moving to the area. Our long term rentals come fully furnished for easy move-in. Bringing a pet? No problem! We have long term pet-friendly rentals too! Take the stress out of house hunting and book one of our available long term Lake of the Ozarks rentals today. Long Term Rental / Finders Fee - is great for local property owners who wish to stay anonymous during the tenant placement process. Once a tenant is pre-qualified, we turn that tenant over to the owner for the remainder of the lease term. We pre-qualify tenants for both of our long-term rental programs with background and credit checks, share that information with you, the owner so you can decide on tenant selection. These Houses and Condos are located in the City of Osage Beach, MO and offer guests the best of everything along the shores of Lake of the Ozarks. Search our beautiful Osage Beach vacation rentals, or give us a call to determine which region of the lake is best for you. Bring your furry friend along on vacation with the entire family with our pet-friendly vacation rentals here in Lake of the Ozarks. In addition to having many lakefront properties perfect for swimming many also have large yards great for playing fetch too! Conviently nearby there are also numerous hiking trails to explore and other pet-friendly activities to be enjoyed! With so many fun and exciting things around for Fido, hell want a great place to sleep it off, so what are you waiting for, start your search below for the perfect pet-friendly rental. Contact our office prior to booking any pet-friendly rentals to ensure there are no breed restrictions and to confirm any pet fees that may be applicable.